Smart Cities initiatives just got an important new tool courtesy of Libelium, the Spanish firm that consistenly pushes a broad and diverse vision of the Internet of Things’ potential. The sensor is part of Libelium’s growing Waspmote Plug & Sense! wireless sensor network platform. It works by detecting changes in ambient light, as well as temperature and humidity, and can work both in and out doors. The system allows municipalities to vary lighting levels in a given area as patterns in street usage vary during the night. Sensors such as the lighting one can be added to the Waspmote unit or replaced without having to uninstall the mote itself, keeping maintenance costs low for a scalable and sustainable solution. Not only can it save municipalities money, but the system can also reduce the problem of “light pollution” that many cities are trying to reduce through much more targeted use of municipal lighting. For much of my career I was an environmental strategist, emphasizing new technologies that could cut waste and boost the economy. As a result, I was delighted to read a new report that projects up to 16.5% cuts in greenhouse gas emissions by 2020 with major initiatives in Machine-to-Machine (M2M) technologies — as much as could be brought about by switching to renewable energy sources. It proves my long-held belief that the environmental movement has wrongly been associated in corporate minds for too long with sacrifice, and instead should be seen as eliminating waste and increasing efficiency. In other words, the IoT can be a win-win solution for the environment and the economy. The report, “Machine to Machine technologies: unlocking the potential of a $1 trillion industry,” was written by the Carbon War Room with assistance by AT&T. The Carbon War Room is ” a global entrepreneurial initiative set up by Sir Richard Branson that accelerates entrepreneurial solutions to deploy profitable, scalable clean technologies across industry sectors.” It is a registered US non-profit. The report is predicated on a 23% annual growth rate in M2M products and services between now and 2020: from 1.3 billion devices worldwide to 12.5 billion. This should also result in almost a trillion dollars of annual revenue by the end of the decade. Energy production, distribution and use emissions could be cut by 2.0 Gt of Co2e (CO2e is the concentration of CO2 that would cause the same level of radiant forcing as a given type and concentration of greenhouse gas) by 2020, primarily by promoting “smart grid” technologies such as smart meters and demand-response systems. M2M can also improve energy production and transmission, while fostering the transition to renewables. Transportation emissions could be cut by nearly 1.9 Gt of Co2e in the same time period by optimizing routes of all transportation modes so people and goods are moved as efficiently as possible. Built-environment emissions would fall by 1.6 Gt of Co2e by 2020 by increasing the efficiency of building systems such as HVAC, lighting, electronics and appliances, and security systems. Lack of performance data that make it hard for potential clients to quantify the cost-benefit ratio of new investments in M2M solutions. Incompatible sales models and long sales cycles since M2M pricing remains high. Alternative business models and new marketing strategies. Increasing emphasis on global standards. Telecom and other companies should make M2M part of their core businesses. Adding innovative new business models and sales. It seems to me that quantifying the greenhouse gas emissions reductions is particularly important, since so many companies have now adopted “triple-bottom line” accounting. The vast amounts of data generated by M2M applications should make that a relatively simple function to add. Add in other environmentally-related IoT initiatives such as HP’s “CENse central nervous system for the planet” (BTW, still frustrated by HP’s unwillingness to give an up-date on its progress!) and it seems pretty clear to me: the IoT is our last, best hope to provide for needed economic growth (especially in developing nations) while simultaneously reducing the greenhouse gas emissions that threaten the planet. I’ve been delinquent about posting my take on Cisco’s recent release of a white paper in which they predicted a $14.4 trillion in what they term “Value at Stake,” (a combination of increased revenues and decreased costs for companies embracing [or lost by companies that don’t embrace it) what they call the “Internet of Everything” between now and 2022). The white paper, “Embracing the Internet of Everything to Capture Your Share of $14.4 trillion,” is by far the most comprehensive projection on the IoT’s near-term growth, and certainly gives cause for optimism (although they warn that the benefits could be diminished if companies don’t adequately provide for robust security and privacy protections!). 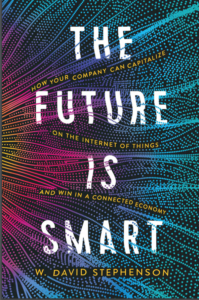 It’s a must read as well because of the case studies included to justify the projections: I’d strongly recommend it as a source of practical ideas to any company wondering about whether they should be launching IoT initiatives. innovation (reducing time to market) of $3.0 trillion. The projections are extrapolated from the benefits that companies are already realizing from early-stage IoT projects such as “smart grids, smart buildings, connected healthcare and patient monitoring, smart factories, connected private education, connected commercial (ground) vehicles, connected marketing and advertising, and connected gaming and entertainment.” The IoT’s future progress is being driven by technologies such as the cloud and economic principles such as Metcalfe’s Law. The report reuses a favorite Cisco statistic, that 99.4% of all “things” that will eventually be linked by the IoT are not linked at this point, so the sky is the limit for the future. I can’t emphasize it enough: this report is must reading for smart business leaders trying to understand the IoT and how to capitalize on it.